The seasons are changing and as the leaves fall from the trees, I thought I'd take advantage when it comes to thinking up craft activities for M. With this in mind, we collected a bag of leaves while we were wondering around Mary Arden's Farm at the weekend enjoying their Apple Weekend celebrations. We also bought two apple trees from someone selling heritage trees. Dave spent a good half an hour talking to the man before making his choice, following my request for more productive plants in the garden. Unfortunately Dave has forgotten the name of the apple trees he (or technically we) bought and all I can say is the sample apples were tasty! The challenge now is to remind Dave to water them whilst they are still in their pots and make sure they are planted before November. Back to leaves, I'm keen this year to do more seasonal crafts to try to instill in her a sense of change as the year moves on. We started on Sunday with a little leaf rubbing, M's first attempt and it's more difficult than you might think. I helped by putting the leaf upside down under the paper and holding everything still, so M didn't keep trying to reposition it above the leaf. M was very enthused and managed to get a fair print of the leaves, even though she was rubbing a little too hard. After that M practised her cutting skills cutting the leaf out, highlighting to me just how complicated a shape a real leaf is! M did the rubbing, I added an outline and cut this one out. This was certainly one the more difficult craft tasks M has attempted and I don't think she did too badly, considering she's still learning how to use scissors. I did a rubbing too! The surviving paper leaves are now adorning my kitchen door, where they keep unsticking themselves and floating gently to the floor, nicely emulating the real thing! I suspect we'll add more to the door before the season is done. After the success of leaf rubbing, I decided to do some simple collage, starting with L is for Leaf. As M (who is a stickler for detail) pointed out to Dave, the L is made of cardboard, not leaves, the leaves are glued on. I decided to use PVA for the glue this time and was disappointed by its lack of stickiness. 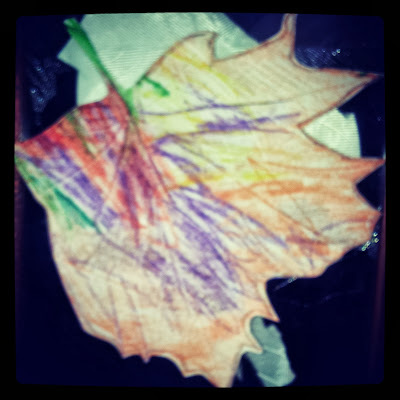 We put the leaves on, but being irregularly shaped, they just wouldn't stick immediately until the glue dried a little. I solved this by putting heavy 'small things' on the leaves while the glue dried to a tacky consistency. I really am going to need to look into good 'craft' glues, since this is bound to come up again. 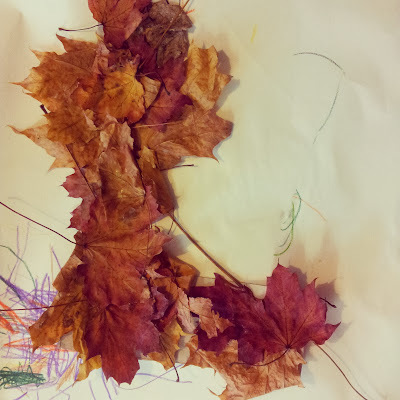 M thoroughly enjoyed sticking leaves to the L and asked if she could make an M, so I cut one out for her and asked what she'd like to stick to it. M chose glitter and sequins, which she loves and generally never misses an opportunity to play with. Here is her M, not as polished or specific as the L, but she enjoyed herself, spending over two hours in all on those two letters, sticking, playing, sorting and telling stories involving glitter, glue and sequins. Now, I just need to think up more things I can do with leaves!